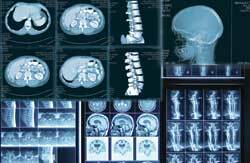 General x-ray and fluoroscopy refers to the most basic of imaging procedures, all of which use a very low dose of radiation to produce an image of a body part. These types of procedures range from an exam as simple as a chest x-ray to procedures in which a contrast material is used (explained below). Most of us are familiar with routine x-rays, where the bones and lungs are easily visualized. No special preparation is needed for these exams and you should be in and out of our center quickly. Certain body parts however, cannot be visualized without the introduction of a contrast media, commonly referred to as “dye”, to make them “stand out” on the x-ray. These types of exams include Upper G.I.’s, colons, IVP’s, arthrograms and myelograms, to name a few. Many of these studies also require special preparation, which we will provide detailed preparations instructions before your procedure/screening. There are several different forms of contrast media. Some, like barium, are drank for procedures like an Upper G.I. and/or a small bowel study. Air is sometimes also used. Upon drinking the barium, the radiologist follows its flow via fluoroscopy (a real-time, x-ray “movie” viewed from a television monitor) and will take permanent static images for your record. When a small bowel exam is requested, the barium’s progress through all 15 feet of the small intestine will be followed with routine x-rays over a period of time which may take up to a couple of hours, depending upon the speed the barium advances through the digestive tract. During colon studies, barium and/or air is introduced into the large intestine via an enema. Like an Upper G.I., it is followed with fluoroscopy and relevant static pictures are taken. Every effort is made to accomplish this exam as quickly as possible and with as little discomfort as possible. Intravenous pyleograms (IVP’s) are done to visualize the kidneys, ureters and bladder. This is accomplished with the intravenous injection of an iodine-based contrast medium. A detailed allergy history will be obtained prior to the injection of any contrast; however, please be sure to inform us if your patient has an allergy to iodine, if you know that he or she has ever had a reaction to an iodine-based contrast media or if they are a diabetic currently taking Glucophage™. At X-Ray Consultants, P.C. (XRC) we use only nonionic IV contrast material, which greatly minimizes the likelihood of a reaction, but we still take every precaution to screen those patients who could potentially be allergic. We may also require certain lab blood tests prior to doing this exam. Arthrograms are studies in which contrast material is injected into a joint space such as a knee, shoulder or wrist in order to evaluate the soft tissues within the joint (cartilage, ligaments, etc.). After the contrast is within the joint space, a series of images are obtained from a variety of positions and angles in order to obtain a diagnosis. Myleograms involve the injection of a contrast medium into the spinal canal, which usually takes place in the lower back region. Depending on what particular area of the spinal canal needs to be visualized, the x-ray table will be tilted to the degree necessary to allow the contrast to flow into that region. When the contrast is in the area of interest, a series of images are obtained. Following this procedure, the patient stays with us, lying flat for a period of time in our Recovery Area and is then released to be driven home. There are so many different types of procedures that we perform that it would be impossible to detail every one of them in this space. X-Ray Consultants, P.C. (XRC) is committed to furthering women’s health within our community. We understand women’s special needs and preferences and have dedicated an area of our center to specialize in women’s services, specifically digital mammography and ultrasound. 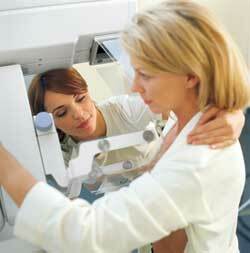 Mammography, along with breast self-examination, is the best defense against breast cancer. Early diagnosis and treatment saves thousands of lives annually. A measure of our commitment to breast health is demonstrated in two mammography sub-specialists in our radiology group: Brett A, Stephens, MD, and Linda L. Tuthill, MD. We also utilize only FDA and ACR-certified, state-of-the-art equipment. Furthermore, we use the most advanced full-field digital mammography system with an R-2™ Image Checker, a computer-assisted diagnosis device, as an adjuvant to our radiologists to ensure that no area has been overlooked. Mammography itself is a safe, low-dose x-ray of the breast(s). There are two kinds of mammograms: screening and diagnostic. Screening mammograms involve two x-ray views of each breast. In the event an area of concern is identified, the patient may be called back for special additional views. Diagnostic mammograms require more views and are usually indicated in situations where patients have had prior breast surgery, implants or fibrocystic disease. In either exam, screening or diagnostic, the breasts will be temporarily and gently compressed in order to obtain the best possible image. Mammograms are brief; usually no more than 20 minutes in duration and there is no advance preparation other than to refrain from using any deodorant, powder or lotion on the breasts or under the arms on the day of your exam. Patients should also wear a 2-piece outfit so that they only need to remove their top in the room. Lastly, they should bring in the name of the facility where their previous mammograms have been performed, should we need them for comparison. Stereotactic breast biopsy and needle localizations are also performed in our center. Stereotactic biopsies involve the precise targeting and tissue sampling of suspicious area(s) of the breast under local anesthesia. In cases where a more conventional surgical biopsy is to be performed, patients are sometimes sent to XRC prior to the surgery so that the exact area can be pinpointed and marked with a wire (“needle localization”) to aid the surgeon. We hope you’ll agree that XRC is delivering mammography services in a manner today’s women want and expect. We also think you’ll see the influence of the women who were consulted in the design and décor of our facility. Osteoporosis (softening of the bones) is a disease gaining attention as more people live longer; however, it is not a condition that is limited to natural aging. In many instances it is associated with post-menopausal estrogen deficiency, secondary conditions that adversely impact bone metabolism and can sometimes even be traced to childhood, if environmental or clinical conditions impeded the development of peak bone mass. The optimum method of diagnosing primary or secondary osteoporosis is with a Total Body Assessment performed on a dual-energy x-ray absorption (DEXA) scanner. Many DEXA scanners measure the bone density of just the spine and femurs, which is appropriate for primary osteoporosis but less than optimum for secondary conditions or for evaluating bone growth. The digital fan-beam DEXA scanner at X-Ray Consultants, P.C. 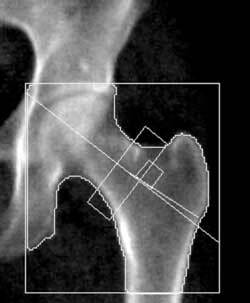 (XRC) is the industry leader in bone densitometry. It can perform a noninvasive total body bone assessment, as well as lean and fat tissue components, including fat percentage, and lean tissue mass. The accurate measurement of total, as well as regional bone and soft tissue composition is clinically relevant in a number of scenarios. A DEXA exam is fast, inexpensive and requires no prior preparation. Clothing does not need to be removed. It can play a major role in monitoring bone and body mass health. CT scanning stands for computerized tomography, sometimes called “CAT Scanning”. CT scanning arrived in the 1970’s and revolutionized radiology, giving physicians a level of detail previously impossible in diagnostic imaging. CT employs a pencil-thin x-ray beam that rotates around a patient who lies inside a donut-shaped scanner. As the x-ray beam passes through the patient it strikes a detector, which is located opposite the beam. After the beam and the detectors have circled around a given level of the body, the information from the detectors is processed by specially-configured computers which formulate the images. An additional CT computer workstation can further analyze the images and depict them in a 3-D format. CT studies are performed on virtually every body part, from head to toe. 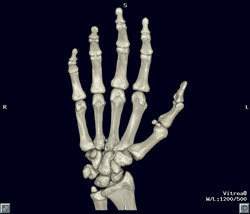 Sometimes intravenous iodine-based contrast material is required to enhance particular areas. A detailed allergy history will be obtained prior to the injection of any contrast. However please be sure to inform us if your patient has an allergy to iodine, if you know if he or she has ever had a reaction to iodine-based contrast media or if they are a diabetic currently taking Glucophage™. At XRCMI we use only nonionic IV contrast material, which greatly reduces the likelihood of a reaction, but we still take every precaution to screen those patients who potentially could be allergic. We may also require certain lab blood tests prior to injecting the contrast. In other instances the patient may need to drink a radio-opaque contrast medium to better define the intestinal tract. In either event, everything we do is intended to deliver the best possible exam and the most diagnostic information for you and your patients. With the recent development of sub-second CT scanners (which we have at X-Ray Consultants, P.C. (XRC)), fascinating noninvasive imaging procedures can now be performed that previously required considerable invasion. One example is CT angiography, wherein a simple injection of IV contrast can be used to render a detailed study of blood vessels. Another procedure is virtual colonography, which may soon rival colonoscopy for information without the need to undergo sedation or the insertion of a colonoscope. Ultrasound is a fantastic imaging modality, not just because of the high-quality images it produces but because it’s also simple, painless and does not involve ionizing radiation. The working principle behind ultrasound is similar to that of sonar, which is used by the U.S. Navy. First a conducting gel is applied to the body part being examined. Then a transducer, a wand-like instrument, is moved across the gel. The transducer emits high frequency sound waves which penetrate through the gel and the patient’s skin. As the sound waves penetrate various body parts, they are bounced back, like echoes, and returned to the transducer. 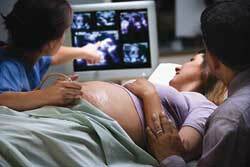 The transducer then relays these signals to the ultrasound machine which constructs an image. X-Ray Consultants, P.C. (XRC) ultrasound equipment is the finest available. It features “compound imaging” which averages three different angles for each sound wave to produce sharper, clearer images than conventional ultrasound. We are also able to produce 3-D images of certain structures, even an unborn baby, depending on the baby’s position within the womb. Ultrasound is useful in a number of body locations. It is most commonly employed in imaging the pelvis and abdomen, although it is also frequently used in the area of the neck and in extremities. It can also be enhanced by a special Doppler system to image moving blood flow within vessels. Many ultrasound studies require a special preparation, such as a full bladder to better visualize structures like the uterus and ovaries. PET-CT Fusion Imaging is the very latest imaging technology that combines the anatomical detail of CT (Computerized Tomography) with the molecular metabolic information derived from PET (Positron Emission Tomography). X-Ray Consultants, P.C. 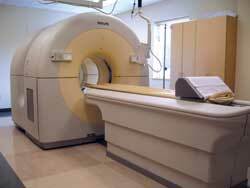 (XRC) Medical Imaging was the first facility in the area to offer PET-CT Fusion Imaging. It is the very latest imaging technology that combines the anatomical detail of CT (Computerized Tomography) with the molecular metabolic information derived from PET (Positron Emission Tomography). Almost everyone is familiar with CT or “CAT” scans, which have been commonplace in medicine for approximately 30 years. Today’s CT scanners are better and faster than ever, capable of producing up to 16 “slices” of imaging in 0.5 second. Still, they are sometimes unable to detect tiny, often sub-clinical malignancies. Left undetected (and therefore untreated), these malignancies will grow and possibly metastasize, making their eventual treatment more challenging. Even when they are detectable on CT scans, they merely appear as abnormal masses and there is often uncertainty with regard to whether they are malignant or benign. More recently, PET imaging has become a technology available in most communities. PET imaging is a nuclear medicine procedure in which a radioactive isotope, 18-fluorodeoxyglucose (FDG), is injected intravenously. The glucose, or “sugar” component of the FDG allows it to be “taken up” in cells seeking sugar. Because cancer cells are sugar-seekers, a disproportionate amount of FDG is captured within malignancies, making even tiny tumors visible during the scanning process. PET therefore, succeeds where conventional CT fails, because it provides for the imaging of very small tumors, and while a diagnosis of cancer cannot be made without a biopsy, PET can prove to be a strong indicator. Furthermore, the PET scanner can generate SUV’s (Standard Uptake Values) for any point of FDG uptake, which in some instances serves not only as a further indicator of malignancy but also the tumor’s “grade”. PET has also proven very useful in staging cancer patients, sometimes eliminating the need for surgery. Unfortunately though, PET scans do not show nearly the anatomical detail that CT scans do, and while physicians can often identify potential malignancies, they are sometimes unsure of their exact location. This conundrum has led to the development of a hybrid PET-CT combination scanner in which PET and CT imaging are done simultaneously and “fused” together to provide the best features of both CT and PET on a single image. In essence, it provides the best of both the CT and PET worlds. In addition to providing more information, PET-CT is actually quicker to perform than a standard PET. Scan times are only about 20 minutes (as compared to PET’s 45 minutes) because the hybrid scanner utilizes both the transmission radiation from the CT tube and the emission radiation from the FDG. PET-CT also eliminates the need for urinary bladder catheterization, which is uncomfortable for patients. PET-CT is covered by most insurance and by Medicare. Medicare is continually adding to its list of approved clinical indications for PET and PET-CT.
PET-CT is useful for more than just “finding” and staging cancers; it can play an important role in monitoring a tumor’s response to chemotherapy or radiation therapy. In many instances a follow-up PET-CT scan can be performed after the first cycle of therapy to gauge the impact of a therapy regimen. If there has been a significant reduction in the tumor’s size or SUV, it can safely be said that the therapy has been successful and if indicated, can be effectively continued. On the other hand, should a follow-up PET-CT show little or no tumor response, a change in treatment might be indicated. This, obviously, can significantly improve treatment outcomes, shorten treatment durations and provide substantial cost savings. It is part of our mission to provide “…the highest caliber of medical imaging services…” PET-CT fits perfectly with that statement. It is our vision to continue to be the imaging leaders in our community and to always be at the forefront of bringing technologies like PET-CT into the community.